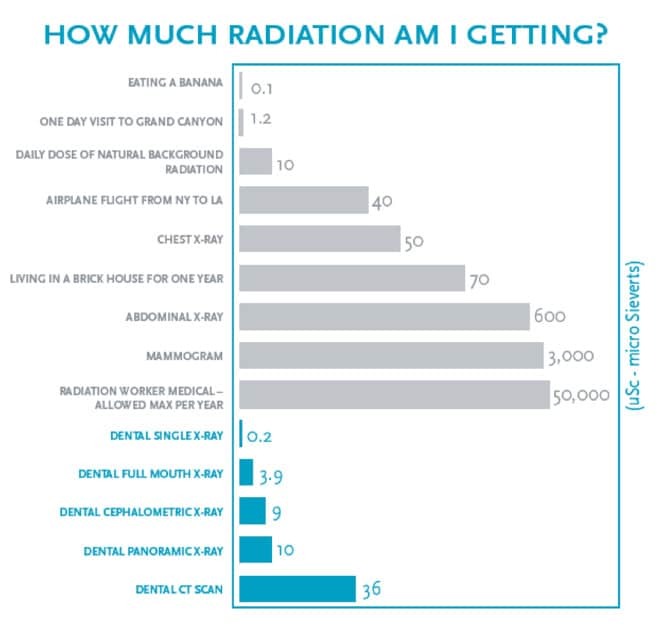 Home » Dental X-rays: How much radiation am I really getting? Since Lincoln Pediatric Dentistry opened its doors in 2004, countless parents have asked about the safety of dental x-rays. Dental x-rays are critical for us to be able to rule out decay on your child’s teeth. They also let us see how permanent teeth are developing and whether there are any developmental abnormalities present. Often parents worry about how much radiation their child will receive when taking an x-ray. This is a concern that we take seriously. The safety of our patients is our number one priority. This chart helps to show just how safe an x-ray can be! In our office, we typically complete single x-rays or panoramic x-rays. We take extra precautions to protect your child each time we require an x-ray. First, we place a lead apron over your child (our dental assistants will wear an apron also). These aprons block unnecessary x-ray radiation exposure. 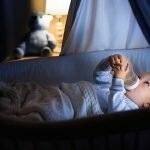 Limiting the number of x-rays taken protects your child as well. We take x-rays only when necessary. We aim for one time per year, but not every child is the same. 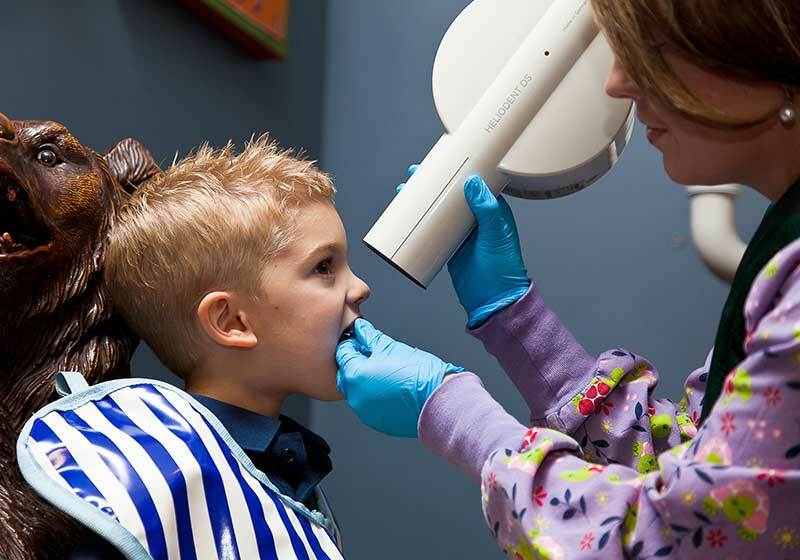 If your child has any areas of concern, our dentists may prescribe additional x-rays. Lastly, we use digital x-rays instead of film x-rays. Digital x-rays give 70% less exposure to radiation than film x-rays do. What many people do not know is that exposure to radiation occurs every day. According to the American Cancer Society, radiation occurs naturally in rocks and soil. This would explain why a one-day visit to the Grand Canyon would affect your radiation dose for the day. Even drinking water and eating plant-based foods may contain tiny amounts of radiation. For example, the first thing the chart is eating a banana. Because bananas contain potassium and potassium decays, they become slightly radioactive. However, zero cases of radiation poisoning have been reported from banana consumption. YES! Bananas have radiation. YES! We still want you to continue eating bananas. We understand that radiation can be scary. 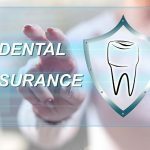 But with the precautions we take at Lincoln Pediatric Dentistry, you can relax knowing that your child is safe while getting dental x-rays taken. If you have questions about any films we take, please let us know! We are happy to explain why we would prescribe certain x-rays for your child.